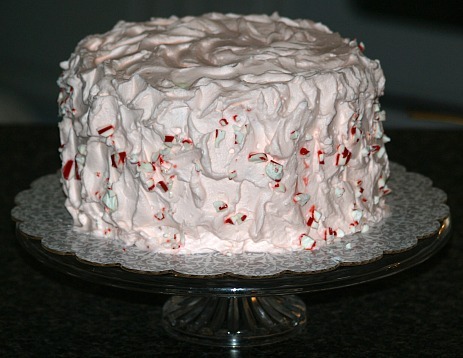 I love learning how to make Christmas dessert ideas; they must include peppermint. It just would not be the same without it. Maybe it is simply because our traditions have always included flavorful candy canes. Peppermint is one of the oldest and most popular flavors used. It has long been used for popular desserts, drinks, candies and other recipes. This flavor has also been popular in chewing gum, mouthwash and toothpaste. Not only is peppermint a favorite for many recipes and other foods, but it has a long tradition of medicinal use. Perhaps you have sucked on one of those little round peppermint candies if you have had indigestion. I have had many tell me it works better than any medicine. It is also often used for upset stomachs and vomiting. Some of the recipes below are not only flavored with peppermint extract but some includes the addition of peppermint candies. As I was learning how to make these Christmas dessert ideas I found that the peppermint candies makes a very pretty presentation. This delicious triple chocolate cake has a peppermint filling and a rich chocolate filling with a rich chocolate frosting. I found when I learned how to make Christmas dessert ideas that chocolate with peppermint is always welcome addition to the menu. Grease 3 round cake pans (8 inch), line with wax paper, grease again and flour and set aside. Melt chocolate squares in a heavy saucepan over low heat stirring until smooth; set aside. Beat butter on medium speed until creamy gradually adding the sugar; beat well. Add eggs one at a time beating after each; stir in melted chocolate. Combine flour, cocoa powder, baking powder, baking soda and salt; sift twice. Add flour mixture to chocolate mixture alternately with milk while beating on medium speed. Beat in the vanilla; divide batter evenly into prepared pans. Bake in preheated oven at 350F degrees for 25 minutes or until pick comes out clean. Cool 10 minutes, remove cakes from pans and cool completely on racks. TIP: Stack layers rotating each layer until the top appears to be level. Cut a ¼ inch V-shape notch down the side of the cake to use as a guide when assembling the cake. Cut each layer in half horizontally making 6 layers; place 1 half on a cake plate. Spread layer with 1/3 of the mint cream filling; top with another layer lining up the notches. 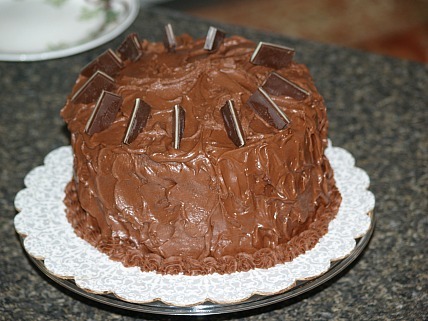 Spread layer with half of the chocolate filling; top with third layer. NOTE: At this point cake can be frozen for up to 1 month. Frost top and sides with rich chocolate frosting. 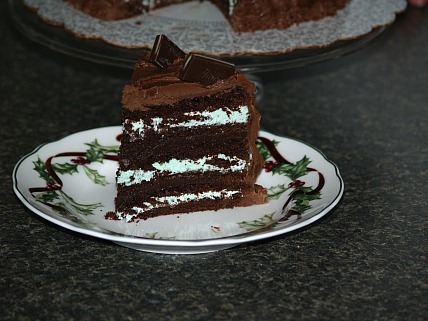 The mint filling compliment the rich chocolate taste well making this a perfect Christmas dessert idea. Combine whipping cream and food coloring; beat on medium m speed until foamy. Gradually add powdered sugar beating until stiff peaks form; stir in extract. Combine all ingredients in a heavy saucepan. Cook over low heat stirring constantly until mixture is smooth. Place saucepan in a bowl of ice water stirring constantly until mixture is spreading consistency. This rich chocolate frosting is the perfect topping for this Christmas dessert idea! Combine first 3 ingredients in a saucepan; cook over medium heat stirring until mixture is smooth. Remove mixture from heat; stir in powdered sugar. Set saucepan in a bowl of ice; beat with mixer on medium speed until frosting holds its shape. 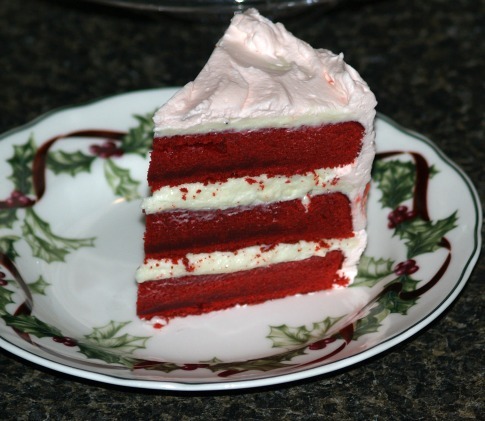 A beautiful red velvet cake recipe with peppermint is a perfect Christmas dessert idea. Grease three 9 inch round cake pans, line with wax paper, grease and flour again; set aside. Cream butter and sugar on high speed in a large bowl until light and fluffy. Combine and blend in a small bowl flour, cocoa powder, salt and baking soda; set aside. In a small bowl combine sour cream, buttermilk, red food color and vanilla. Add flour mixture to butter mixture alternating with the sour cream mixture. Divide evenly among the three prepared pans. Bake about 30 minutes or until pick comes out clean; cool in pan 10 minutes. Remove cakes from pans and cool completely on wire rack. Spread peppermint filling between layers; spread top and sides with peppermint cream frosting. Garnish sides and top with crushed soft peppermint candy; store in refrigerator. This filling makes this cake the perfect Christmas dessert idea. Sprinkle gelatin over 1/3 cup cold water in a small bowl; set 5 minutes to soften. In a small saucepan bring ¾ cup of cream, peppermint and vanilla to a boil over medium high heat. Add gelatin mixture and whisk until smooth. Pour hot cream mixture over chocolate whisking until smooth; cover and refrigerate for 30 minutes. In another bowl beat the remaining ½ cup plus 2 tablespoons cream at medium speed until peaks form. Whisk in chocolate mixture; refrigerate 1 hour before using. Combine ¾ cup cream, peppermint candy and extracts in a small saucepan. Cook mixture over medium heat about 5 minutes; remove from heat. Cover mixture and steep for 15 minutes; strain and refrigerate 1 hour. In a medium bowl, combine remaining ¾ cup cream, peppermint cream and powdered sugar. Beat at medium speed until stiff peaks form; use immediately. This Candy Cake is another great Christmas dessert idea. This impressive cake is festive for any gathering! Cream shortening on medium speed of mixer gradually adding the sugar. Combine flour, baking powder and salt; add to creamed mixture alternating with the milk. Stir to blend after each addition; stir in the vanilla. Beat egg whites until stiff peaks form; gently fold into the batter. Pour batter evenly into3 greased and floured 8 inch round cake pans. Bake at 350F degrees for 5 to 27 minutes or until a pick comes out clean. Cool cakes in pans for 10 minutes; remove from pans and cool for 10 minutes. While warm prick cake layers at 1 inch intervals with a fork; place a cake layer on a plate. Spread with 1/3 cup of the peppermint filling and sprinkle with crushed candy. Frost top and sides with fluffy frosting; sprinkle top and sides with crushed peppermint candy. Melt butter in a small saucepan; add remaining ingredients and bring to a boil stirring constantly and boil 1 minute. Combine sugar, cream of tartar and water in a saucepan. Cook over medium heat stirring constantly until clear. Cook without stirring to soft ball stage 240F degrees. Beat whites until soft peaks form; continue beating while adding syrup in a slow stream. Add vanilla and continue beating until stiff peaks form and frosting is thick enough to spread. All of the recipes above are great Christmas dessert ideas!